Why do I need to hire a concierge medical patient advocate or holistic health coach? You need to hire a private patient advocate to represent and guide you in the medical system for the same reason you would hire a private attorney to represent and guide you in the legal system. Both systems can be confusing to navigate alone, and doctors and nurses working for medical systems often do not have enough time to spend with you to the degree that you may need, whether it be explaining your health, coordinating care between different groups, or figuring out a mystery diagnosis or complex patient. And if you’re dealing with insurance claim denials or large medical bills, you may find yourself receiving little to no help from either the insurance company or medical providers, leaving you to struggle alone. (6) environmental factors (e.g. toxicities, allergens, etc). Most doctors in medical practice lack the time and integrative holistic training to address these issues, and instead focus treatment on a disease specific regimen of medical pills, procedures, and surgeries, which can be costly, may have untoward side effects that make things worse, and at best will only patch up the one disease that is being treated until you get another disease process requiring another set of pills, procedures, and surgeries. That is why Houston Patient Advocacy provides a dual conventional and holistic trained doctor to serve as your personal integrative medical health coach and patient advocate, who can spend the time needed to help you address the drivers of chronic disease (HPA’s Algorithm of SixTM Program) in order to help you lose weight and reduce your dependency on prescription drugs, medical procedures, and surgeries. Furthermore, your medical health coach/advocate can work with you and your existing medical team(s) to help better coordinate care and achieve better health outcomes. Can you make housecalls, care facility/hospital visits, or go with me to my appointments? Yes, we can, if you so desire. Anywhere in the Greater Houston Area, we can follow you at home, work, doctor’s office, care facility, or hospital. Do you provide services for clients outside the Greater Houston Area? Yes, to an extent. Remote advocacy and health coaching services are provided by phone or video conferencing to clients anywhere in Texas. Medical billing advocacy and the Algorithm of SixTM weight loss program can be done nationwide. In-person services, however, are limited to clients in the Greater Houston and surrounding areas. Do you provide transportation for clients to or from clinic/hospital visits? No. We are not a transportation service, but if you need this, we can help you find a company that provides it. Do you provide medical services like a doctor would? 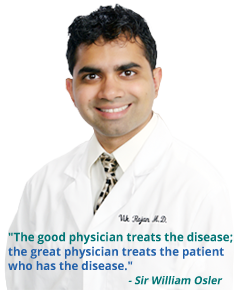 Not directly through HPA, but Dr. Rajan has a separate clinic called Concierge Integrative Medicine of Houston (www.conciergeintegrativemedicine.com) that provides both traditional and holistic medical services, so you can contact Dr. Rajan for details at 281-888-2406 or dr.rajan@houstonpatientadvocacy.com). By acting as a patient advocate / health coach through HPA, we serve as health educators and mediators working with you and your medical team to get the best possible health care and health care outcomes. Do you make medical decisions for the patient? No. Acting as patient advocates, our role is to educate the patient with the best medical information available so that he/she can make the best medical decisions for him/herself, in consultation with medical providers. If the patient does not have decision-making capacity, the decision-making role would fall to his/her next of kin or designated medical power of attorney, which does not include anyone from Houston Patient Advocacy. Would my medical team or hospital object to my hiring a private patient advocate or bringing one to appointments or hospitalizations? No. In our experience, the vast majority of doctors and all hospitals we have interacted with are perfectly fine with a patient bringing along a professional advocate since we provide written authorization from the patient that allows an HPA advocate to be present and interact with the patient’s medical providers. Furthermore, we explain the role we can play and the positive impact we can have in resolving the gaps in communication that sometimes develop between the medical team and patients/families. Good communication between all parties is in everyone’s interest, and they know that. Do you accept insurance? Could I be reimbursed by insurance in any way? Houston Patient Advocacy does not accept any insurance as payment for services. Health insurance does not provide coverage for private patient advocacy, private health coaching, phone consultations, or medical billing advocacy services. Long-term care insurance may be able to reimburse you for private patient advocacy services, but you would have to check with your carrier to be sure. Can I pay for services from my HSA/FSA account? Maybe. You would need to talk to your HSA/FSA plan administrator to make sure, but there are instances of payments for patient advocacy services that have been made from HSA/FSA accounts. What is the cost for services? HPA offers a one-time introductory 30-min health review for FREE (in-office or by phone) to go over your health and medical care and any questions you may have. The consultation may be done either in-office or by phone. Afterwards, cost is based on either a Concierge Membership or Access Pass. Concierge Membership costs $4800/year or $400/month with a 1-year minimum commitment. Members get access to physician-level patient advocacy and health coaching from Dr. Vik Rajan for up to 1 hour a month or 12 hours a year in a 12 month term, which may be utilized by up to 2 people. Consultation time over 12 hours within a 12 month term is billed hourly at a discounted rate of $300/hour. Additional people beyond 2 may be added to a Concierge Membership for an additional $200/person/month x 12 months or $2400/person/year, providing an additional 6 hours per 12 month term. Memberships are limited to 25 total, so call for availability if interested. For an Access Pass, there is a $1200 annual fee which provides 2 hours of consultation time with Dr. Vik Rajan. Any further costs are based on pay-as-you-go hourly rates of $500/hour for any physician-led patient advocacy or health coaching. 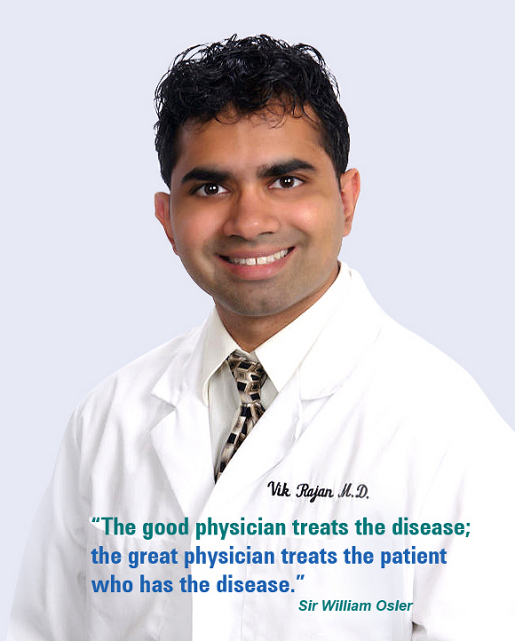 Patient advocacy or health coaching from Dr. Vik Rajan is $600/hour without Concierge Membership. Patient advocacy or health coaching from other physician level advocates is $600/hour. Medical billing/insurance advocacy services are billed at $400/hour. Patient advocacy or health coaching from a nurse advocate or senior care manager is billed at $300/hour. Time is billed based on rounded 5-min increments for services such as, but not limited to, face-to-face visits, phone calls, e-mails, fax, instant messaging/texting, video conferencing, research time, documentation time, document review time, roundtrip travel time (for out of office visits), wait time (for accompanying clients to medical appointments), etc. Services provided locally (within Greater Houston, TX area) include house calls, accompanying to medical appointments, advocating while hospitalized, and assisting with medical billing/insurance issues. Services provided remotely (limited to Texas) include consultations via phone or video conferencing but exclude in-person services. There is an initial 1-hour minimum to sign up. For those interested in The Algorithm of SixTM Nutritional Medicine Review, the initial cost is FREE for a 30-min consultation (in-office or by phone) to go over your health concerns and options for nutritional therapy. Cost of any nutritional supplements purchased from HPA is separate; contact Dr. Rajan for details. If additional consultation or coaching time is needed, a membership plan or access pass may be purchased. Is it cost-effective to spend money hiring a medically-trained patient advocate / health coach? With medical care and health insurance costs spiraling out of control and costly medical mistakes happening all too frequently, hiring a medically-trained patient advocate can help you SAVE money, time, health, and peace of mind in several ways. (1) Better educate you about your care, so that you make better health choices and utilize the medical system in a more cost-effective manner. (2) Review your health records and current medical care to make sure you are getting the best care possible from your medical team, thereby decreasing the chance of medical mistakes which can cost you a fortune (not to mention your life). (3) Provide better communication with your health care providers by spending more time to gather information about you to pass along to the health care team so that they understand how to take care of you better. (4) Give you and your family peace of mind by directly representing you and your interests in a potentially intimidating, stressful health care system, so that you and your family don’t have to “go it alone”. (5) Help you resolve medical claims and billing issues by being able to effectively communicate with your insurer and medical providers, thereby directly saving you money. Do you have a corporate plan for patient advocacy/health coaching? Yes, we do. To learn more, contact Dr. Rajan for further details. For local services, we accept cash, check, credit/debit card (including Visa, Mastercard Discover, Amex), or Paypal. For remote services we accept credit/debit card or Paypal. Regardless of method of payment, we do rquire all clients to have a credit/debit card on file as backup payment. By what methods do you communicate? For local services, we communicate with clients in person, by phone, or by email, depending on the client’s needs. The first meeting, however, is done in person. For remote services we communicate by phone, email, instant messaging, or video conferencing. Our office is located at 6800 West Loop South, Suite 460. It is on the corner of Loop 610 and Bellaire Blvd inside the BB&T building, which is across from the Frost Bank building. Office hours are from 10:00 A.M. – 5:00 P.M. (Monday – Friday) by appointment only, but before/after hours/weekend consultations CAN be arranged by appointment, depending on availability. No. It is by appointment only, so that we’ll know when to expect you. However, if you need an immediate appointment, just call beforehand, and we will take you in if we’re available. Do you take emergency calls? No. If you are having a medical emergency, please dial 911 to go the nearest emergency room.